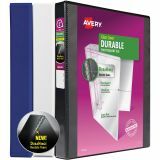 Avery Durable 3-Ring View Binder, 3" Capacity, Round Ring, Black - Durable view binder is perfect for frequent reference, proposals and presentations. 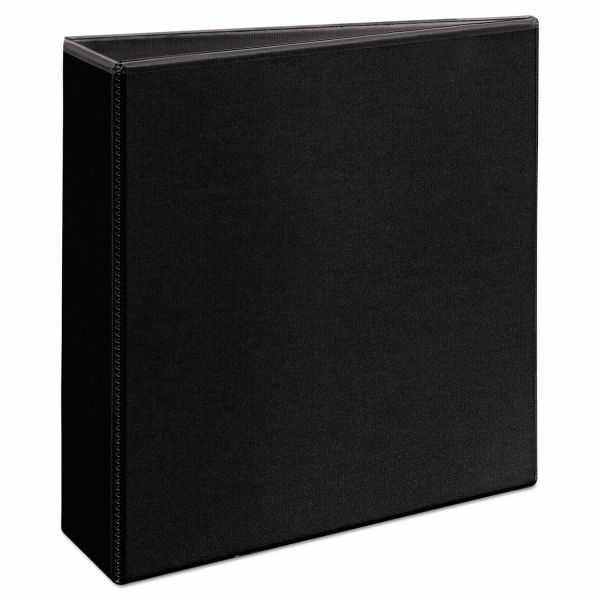 Wide front and back panels fully cover standard dividers and sheet protectors. Overlays on front, spine and back allow easy customization. 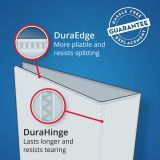 Slant rings have a higher page capacity compared to same-size round rings. Pages lie flat with these back-mounted metal rings. 3 ring capacity accommodates approximately 460 sheets. Design also features exposed rivets on the back, a sturdy chipboard core and two interior pockets to hold loose documents. Each pocket holds up to 20 sheets. 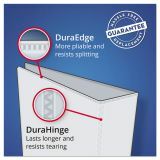 Binder is made with a high percentage of recycled material.